Installation of IP based video surveillance systems, increasing FDI inflow in the region as well as improved implementation of government norms for mandatory installation of video surveillance systems with regulations for the retention of the footage for a time period in mostly all the GCC countries are some of the factors contributing significantly to the growth of video surveillance storage market in this region. According to 6Wresearch, GCC video surveillance storage market size is projected to grow at a CAGR of 8.5% during 2017-23. Countries such as Saudi Arabia and Kuwait have experienced a setback in GCC video surveillance storage market share in the last two years due to decline in oil prices. However, the market is expected to recover from 2017 onwards. Expansion and construction of new hotels, shopping malls and public infrastructure across GCC countries would spur the GCC video surveillance storage market forecast revenues. Storage Area Network (SAN) is expected to demonstrate the maximum CAGR in the GCC region over the next six years due to several key factors such as increasing demand for data centers, flexible than other technologies, better speed, options available for cloud computing along with efficient data management solutions. The GCC video surveillance storage market report thoroughly covers the market by product device, deployment, verticals and countries. 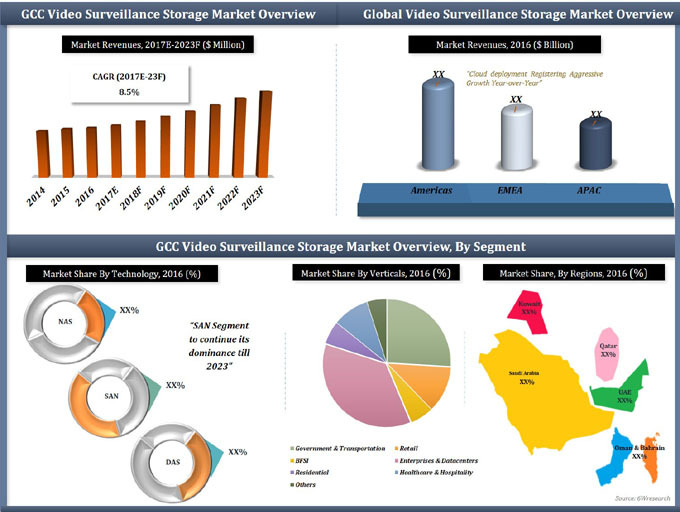 The GCC video surveillance storage market outlook report provides an unbiased and detailed analysis of the GCC video surveillance storage market trends, opportunities/ high growth areas, market drivers, which would help stakeholders to device and align market strategies according to the current and future market dynamics.